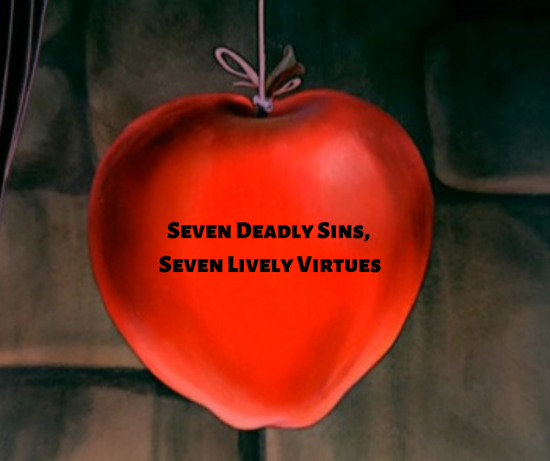 This morning we begin a new sermon series on the Seven Deadly Sins and the seven corresponding Lively Virtues. It was Pope Gregory, in 590 A.D., who compiled this list of sins and named them “deadly” because he regarded them as particularly lethal to the human soul. This list has made it into modern American culture in interesting ways. Did you know that Sherwood Schwartz, who created the TV show Gilligan’s Island, patterned his seven marooned characters after the seven Deadly Sins? And, perhaps you saw the 1995 movie Se7en, in which Brad Pitt and Morgan Freeman played police detectives trying to solve a series of murders that corresponded to the seven deadly sins. According to Pope Gregory’s list, pride is the #1 sin, the queen of all vices. And, the pope wasn’t alone in that assessment. Dante called pride the chief of all sins. St. Augustine described it as the root of all sins, and St. Aquinas described pride as “the first sin, the source of all other sins and the worst sin.” And then there’s C.S. Lewis writing in Mere Christianity: “There is one vice of which no one in the world is free, which everyone in the world loathes when they see it in others, and of which hardly any people…ever imagine that they are guilty [of] themselves. I have heard people admit that they are bad-tempered, or that they cannot keep their heads about girls or drink, or even that they are cowards. I do not think I have ever heard anyone who was not a Christian accuse himself of this vice…There is no fault which makes us more unpopular, and no fault which we are more unconscious of in ourselves. And the more we have it ourselves, the more we dislike it in others. The vice I am talking of is Pride…The essential vice, the utmost evil, is Pride. Unchastity, anger, greed, drunkenness, and all that, are mere fleabites in comparison: it was through Pride that the devil became the devil: Pride leads to every other vice: it is the complete anti-God state of mind.” Wow….tell us what you really think, C.S. Pride appears early and often throughout the Bible. God has barely finished the work of creation when pride rears its ugly head, aborting Adam and Eve’s unfettered communion with God and leading to their expulsion from the Garden of Eden. God had made a home of unending beauty, abundance and delight for the pair, placing them in the garden to oversee creation and enjoy life together with each other and with God. God tells Adam and Eve that they are free to eat from any and all the trees in their care, except for the tree of the knowledge of good and evil which is in the center of the garden. Some people have asked why God put the forbidden tree in the garden in the first place, if Adam and Eve were not to eat from it. Aside from the entire theological discussion of “free will” which will have to wait for another time, perhaps this tree is there to remind the man and woman that they are not God. There are limits to what they—and we—can do as humans. You can do lots and lots of things on God’s good earth, but you cannot be God. Only God can be God. The serpent slithers up to Eve in chapter 3 to ask a question, a seemingly innocent one: “Did God really say you must not eat from any tree in the garden?” The serpent frames the question in such a way that it plants seeds of doubt in Eve. Did God really say that? Instead of focusing on God’s extravagant provision of all the other trees in the garden, the snake exploits the one, single boundary, exaggerating the prohibition and making it appear unreasonable, even restrictive. His question casts God in a negative light. Maybe God is being too constraining. If God really loved you, would God limit you this way? And that does it. The temptation to be like God proves irresistible. Within a span of one verse, we are told that “she took…and ate; she gave…and he ate.” Adam doesn’t say a word, doesn’t register a single note of hesitation, apparently eagerly acquiescing to the desire to be like God. In a number of contexts, pride has evolved into a positive word in our day. We talk about taking pride in our work or in a job well done; being proud of our kids or grandkids. This kind of pride is about dignity, respect or affection. The sin of pride is altogether different. Pride is a deadly sin when it is rooted in ego, in self-absorption or an inflated sense of self. Religious people are particularly susceptible to pride. There is a tendency for smugness to creep into our hearts when we’re trying to live a moral life. We begin to think of ourselves as morally superior, as “better than” others. It causes us to look down on other people and as C.S. Lewis says, “as long as you’re looking down, you can’t see something above you. As long as you are proud, you cannot know God.” Or, put another way, you can either be full or yourself or you can be full of God, but you can’t be both. The antidote to pride is humility. Humility is not, as is sometimes assumed, a posture of thinking badly of ourselves, of having no self-esteem, or being a doormat. Humility means not that you think less of yourself but that you think of yourself less. Humility leads us to have a healthy self-image, seeing ourselves as God sees us. At its core, humility means that we live in conscious, grateful, daily dependence on God, recognizing that God is the source of all that we are and all that we have. But, friends, that is dead wrong, and that wrong thinking has enormous implications for your life. When God thinks of you, the first thing God feels is love. Yes, we humans are messy, but we are God’s marvelous creation, as well. Yes, we are flawed and broken, but we are also beloved. God made us, loves us and is working continually through the Spirit to redeem every part of us. God is leading us away from pride and towards humility not so we’ll be more acceptable or more loveable, but so we can be more human, more of our true, authentic selves, more of the exquisite men and women we are made and called to be. Rather than bearing the weight of trying to appear better than we are, perhaps instead we could just “act medium.” The story is told of a group of children who built a clubhouse in their neighborhood. It was a place where they could meet in solemn assembly, as only kids can do, or just hang out, play games and have fun. The children thought long and hard about the rules for their clubhouse, and they finally came up with three. All club members had to abide by these three rules: nobody acts small, nobody acts big, everybody acts medium. Which, when you think about it, is pretty good theology. Thanks be to God. Amen.